Description: The Feather Bar is a unique sennit that's suitable for a variety of Macrame projects. It features alternating colors and a double layered design. So one color rests above the other, which makes it thicker than a regular sennit. The colors are reversed on the back. 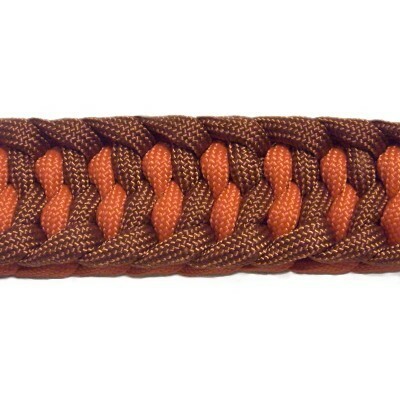 Paracord bracelets and belts can be constructed with this design, along with pet leads, plant hangers, and more. 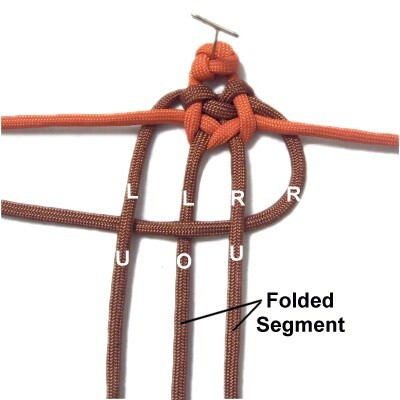 In these instructions, the knots are tied around a folded segment, so there is a loop at one end that can be used for a clasp. 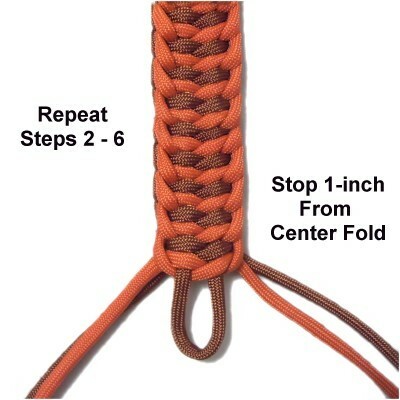 But you can also create this pattern with two folded cords or four separate cords. 2018 Update: Significant changes have been made to the instructions, so contact me if you need the original page. This design came from the Fusion Knots website. Click on the image or link to visit. 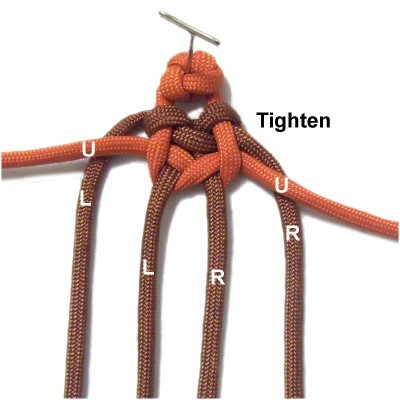 The video gallery contains tutorials for a variety of interesting knots. Step 1: To practice the Feather Bar, you need two cords at least 60 inches long. 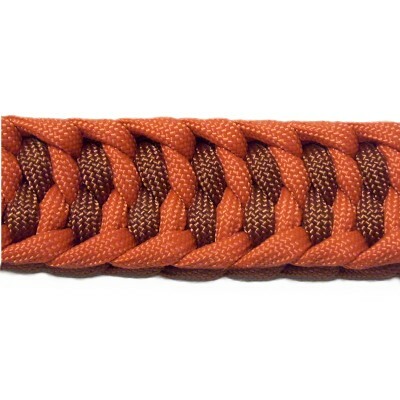 When using this technique for a project, determine the finished length, which should include a loop for a clasp if you need one. Multiply that by 10, and cut both cords to that size. Please read the bottom section of Cord Preparation to learn how to prepare Paracord if you plan to use it. That's the material shown in the images. Fold cord A in half, and secure it with the fold close to the front of your board. 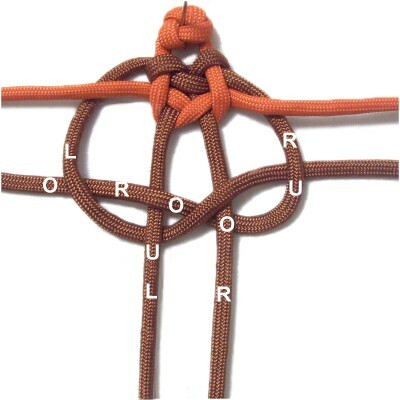 Use the right half of the cord to make a clockwise loop, passing over the folded segment. Important: The distance between the center fold and the loop should be the finished length of the item you are making. 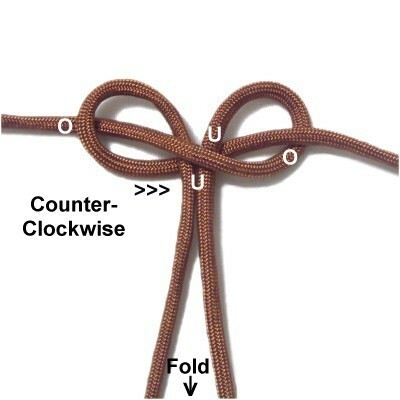 Make a counter-clockwise loop with the left half of the cord, passing it over the right half and under the folded segment. Pass it through the right loop under - over. Tighten the loops slightly, leaving some room for the other cord. 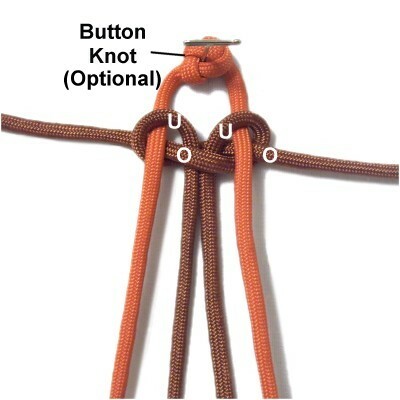 Tie a button knot in the center of cord B (optional). 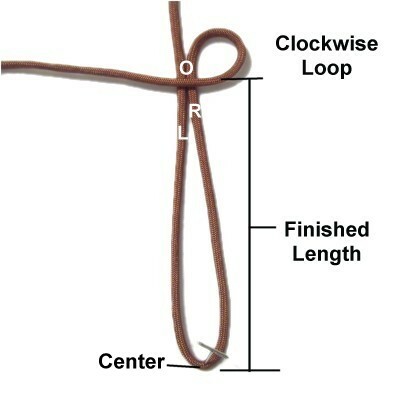 Pass each half through the loops in cord A from below (under - over). Make sure it passes over the portion leading to the ends. Tighten the two loops firmly and secure both cords. To make a clasp, you need either a button knot, a bead, or a regular shank type button. At the other end, you leave a loop suitable to fit around it. The button knot shown in the example is the Oysterman Knot. Another great choice is to tie a Knife Knot. Tighten it completely without a loop. It's hard to keep track of the two working ends, since they switch places. So mentally label them where they are resting at the beginning of each step. The key to successfully creating the Feather Bar is to use the working ends of one cord at a time. Move the cord you are not using out of the way when you construct the knot in step 2. 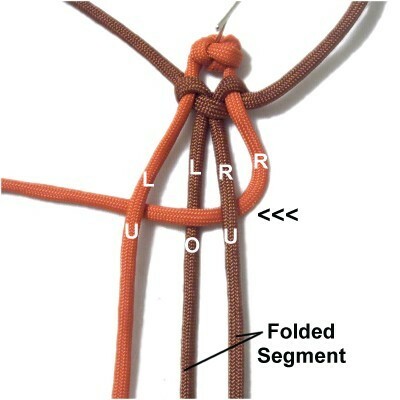 The folded segment of cord A should be mentally labeled right versus left. The tightening process is easier if you secure it with tension. Step 2: Move both working ends of cord A out of the way for now. Move the right working end of cord B to the left, passing under - over the folded segment of cord A. Bring it under the left working end of cord B. Move the left working end of cord B under the left half of cord A (folded segment), heading right. 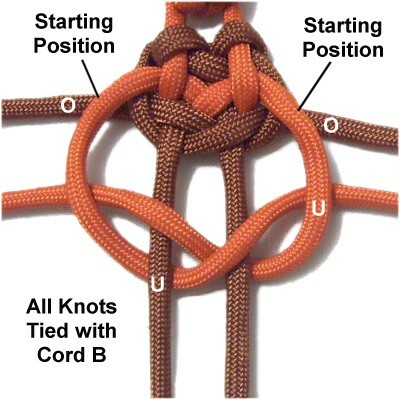 Pass it over the right working end of cord B, as well as the right half of cord A, in the center of the knot. Bring it under the right working end near the curve. Step 3: Tighten the first knot by pulling on the working ends of cord B. Arrange them horizontally when you are done. Move each working end of cord A under cord B, arranged vertically. 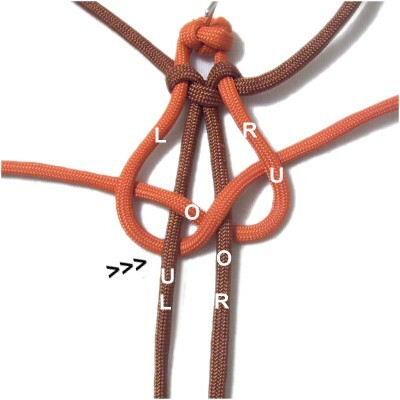 Important: Before you tie a knot with cord A, you need to pass the working ends UNDER cord B, as shown in the image above. Before you tie a knot with cord B, you pass the working ends OVER cord A. You can see this in the image for step 5. The best place to change the starting position is during tightening (step 3). Step 4: Move the right working end of cord A to the left, passing under - over the folded segment. Bring it under the left working end. Move the left working end of cord A under the left half of the folded segment, heading right. Pass it over the right working end of cord B, as well as the right half of the folded segment. Step 4, continued: Tighten the knot by pulling on the working ends of cord A. Arrange them horizontally when you are done. Move the working ends of cord B over cord A on both sides, arranged vertically. 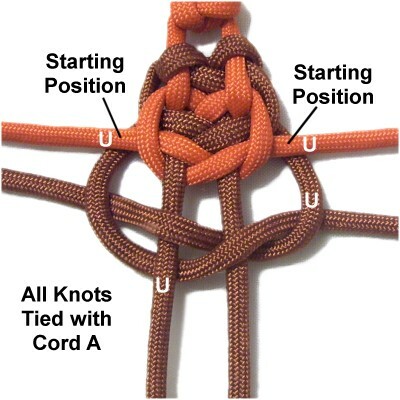 Important: From here on, all the knots made with cord B will have this same starting position (see next image). Step 5: Repeat steps 2 and 3, using cord B to tie the next knot. Designer's Tip: In the images above and below, I've labeled the segments you pass the left working end under. Creating the Feather Bar will go faster if you focus your attention on those two segments and pass over everything else. Step 6: Repeat step 4, using cord A to tie the next knot. Step 7: Repeat steps 2 - 6 several times, until the last knot is approximately 1-inch from the center fold. There is one more knot to tie, so keep that in mind when determining where to stop. The loop needs to be large enough to fit around the button knot at the other end. Step 8: Tie a Square knot with the working ends of the cord you used last in step 7. 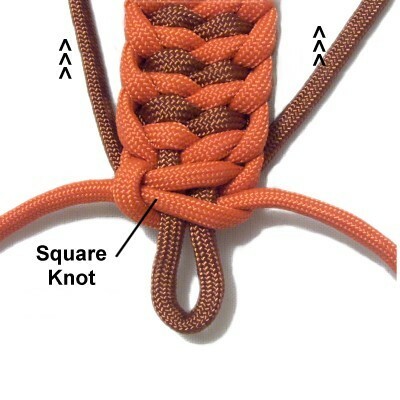 The first half should be tied around the ends of the other cord and the folded segment. Move the working ends of the other cord backward, then tie the second half around only the folded portion. Step 8, continued: Finish off the ends of both cords in the manner most suitable for your project. This is optional if you are just practicing the Feather Bar. When using Paracord, melt the tips as you did in preparation. Have any comments about the Feather Bar? Contact Me.